I opened my mail this morning to find these photos sent by one of my clients. These shirts are from the "Vivienne Westwood Man" collection. 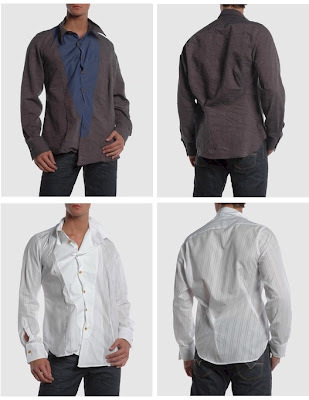 My client loves the funky look of these shirts (so do I), but wants me to "interpret" these styles to fit into his more conventional wardrobe. This will be a fun assignment. I like many of the design details, but will lose the mismatched button/buttonholes while keeping the asymmetric shirt fronts with the V-shaped insets. Those funky back darts? Those will be going...going...gone! While cool for many I'm sure, they just look odd and rather contrived to me...or like a Home-Ec project gone way wrong! Wow! There are some really cool ideas there and it will be fun to see what you do with this. I agree that the funky back darts and mismatched buttons/buttonholes can go. I can't wait to see what you do with your shirts with these shirts as the inspiration! I cannot wait to see your version, Pam. I agree the back darts have to go. I actually like the back darts, as long as you treat them as decorative, not structural. Well....I'm all for decorative darts! I just don't like what these particular darts seem to do to the drape of the back of these shirts. Those are sure some funky shirts. Looking forward to seeing what you do with these as inspiration cuz your shirts rock! I like the back darts too, at least on the darker shirt. The white shirt "shows off" the darts too much, and makes them look odd. The dark one looks more like a Miyake-type design detail, and since this is on the back of the shirt, and I assume your client may be wearing these under a suit or jacket much of the time, this wouldn't necessarily show unless he wanted it to. I think it probably does great things for the fit, but you might have to almost fit it on him to make them hang right. The dark shirt's back folds hang much more nicely too, which could be a problem. I look forward to seeing what you come up with. Fun project! They look like they partied hard and just rolled out of bed... I know your interpretation will be fabulous! Great shirts! The white tone-on-tone stripe looks to be off grain but not enough to be bias. Interesting. Looking forward to see what design details you choose to keep and what you change. I really love the way you sew. I have never seen darts like those. optically both shirts make one shoulder look much larger than the other. Ugh. Look forward to your interp.!!!! Still, can't wait to see your version! I read your entry for today (2-12-08) and was remembering these shirts. I wondered what you came up with?